Hammocks are just about the best way to get a spot to sleep. Hanging a hammock can seem daunting for the inexperienced, but it really doesn’t have to be that hard. If you are thinking about how to hang your hammock, you’re about to find out. Hanging your hammock really depends on where you are and how you would like to do it. Are you looking to hang it indoors or outdoors? Hanging it inside your house usually consists of a couple of eyebolts. 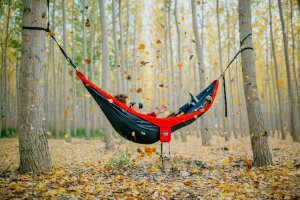 You may even be able to buy a hammock frame to stretch your hammock on. Hanging a hammock outdoors can be done in a variety of ways. This too depends on what supplies you have on hand to tie up or hang your hammock from. Any fixed object can be used: trees, boulders, vehicles or man-made structures. It’s pretty straightforward to hang a hammock from a tree. You need to keep in mind that you want to hang it somewhere high enough that you can get on it but not low enough where you’ll be touching the ground. And, the structures you tie it on need to be strong enough to support your weight. So, no, sticking sticks in the ground and hanging your hammock from it will not work. Rather, find strongly rooted trees to get started! But then, also consider the distance between the trees. It needs to be wide enough for you to span your entire hammock and not keep it crunched up or so spread out that it doesn’t allow you to sit in it. You’ll want to find trees that will be able to hold your weight and are at the proper distance for your hammock length. The ropes should tie off at about 65” off the ground. That will also change depending on the hammock, weight of the user, and length of the user. I actually just take into consideration the ability to get on the hammock without having to jump on it and fall right over. Not that I have done that before. A common mistake is to hang your hammock where when you get in it your derrière rubs on the ground or is close to it. The last thing you want is a rodent or bug having easy access to your body to sting you or climb into your cozy hammock for a nap. When hanging your hammock from a tree try and choose a tree with a branch or knot in it so your rope can grip onto it. 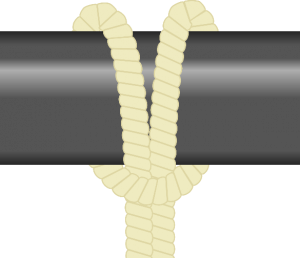 If you don’t have a knot or a branch in the tree, the rope will simply slide straight down whereas the knot or branch can catch it. A few other options are to use a long branch propped up along the tree to pin the rope or a nail/screw that will be driven deep enough into the tree to hold the rope into place. Hammock straps are an easy alternative that you can purchase cheaply and keep you from falling. These are simple to use and won’t hurt the tree. Some hammocks will even come with these straps to make your job much easier. 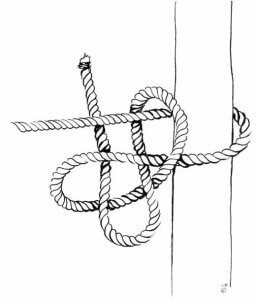 For the knot lovers, try to tie this hammock knot to keep you from slipping! If you are taking a road trip or are at a campsite, it might not be easy to find 2 trees that fit your needs. In this case, you might want to use your car, truck, or SUV as a place to tie your hammock. This makes it much easier for you to get the right distance you need for tying off. If you have a sturdy roof rack or roll bar just tie the rope off on a sturdy section. It really won’t get much easier than this. Hatchbacks can also be used by doubling your rope over tying a double knot and slipping it into the top of your hatchback. Now close the hatch, pinching the rope inside. Another option is to make a cow hitch and put a rag through the loop, pinning it in the hatch. This is also a good way to get a hammock attached to 2 vehicles. Just use the same principle for both vehicles. If you don’t have a hatchback or some sort of roof rack, make a cow hitch and put a rag or similar material in it. Open both front or back doors and run the rope through your vehicle. Go to the far door and shut the door, pinning the cow hitch on the outside. Pull the rope tight and over the door closest to your hammock. This is a secure way and safe way to hold one end of your hammock. Tie the other end off on any sturdy object. It’s not that hard to figure out how to hang your hammock, but it is an important task to know how to do right. Not every situation will be the same. Here are a few other considerations to take into account. Do not tie off on any dead trees. Look up and consider falling debris. Widowmakers can fall on you while you sleep, hurting or even killing you! Beware of poison growing on trees or beneath your bed. Bees may be living in the tree or structure you are tying off on. Even if you get away with tying on them, they may not like the vibrations you make when you move around in your hammock. Mosquitos! Don’t plan on sleeping much if you set up your hammock in a wet area. Even if you chose a good spot, darkness can bring out mosquitos in wet soil. Find a dry spot that isn’t too close to a water source. You may find yourself covered in bug bites by morning. Don’t set up on an animal trail. Take a look at the area to see if you have active animal trails around you. You just may be blocking a bear trail! Now that you know the do’s and dont’s of hanging a hammock, you’ll be able to pick a great spot and hang your hammock. Have a safe and good night sleep!